Amy Katz, a young member of the Pittsburgh community, is fighting leukemia. Amy's Army exists to find a bone marrow donor for Amy, and to help others find their matches. Please visit our In the News section to see some of what the press had to say about the phenomenon that Amy's Army has become. You can read newspaper articles and watch TV news video coverage that we have archived on this page. Please add this logo button to your own Web site. Clicking it will take the visitor to this Web site, helping us to get our message out to the world. To add this button to your page just copy and paste the following HTML code into an appropriate spot on your site. The image will download directly from the www.amysarmy.org server. If you don't have the free Acrobat Reader needed to read PDF files found on this site you may download the installer file by clicking on this button. and 25 marrow donors have been found for other patients looking for a match. But none so far for Amy. Amy’s Army is a devoted group of volunteers dedicated to finding a stem cell donor who can help Amy get well again. As we search for her perfect match we also enlarge the ranks of the National Bone Marrow Registry, thereby helping thousands of others like Amy who are also searching every day for their perfect match. Many of you have asked how Amy is doing. Right now she continues to respond to her medication and is doing well in school, participating on the high school crew team as a coxswain and hanging out with her friends. We hope that the medication keeps working and holding her leukemia at bay. Knowing the treatment is not a cure...we continue to search for her donor. To all of you that have taken the time to learn about the National Marrow Donor Program and become donors, we are eternally grateful. Please continue to pass the word onto others to help Amy and others like her in need. In 2003, Amy was diagnosed with Chronic Myelogenous Leukemia (CML). CML is a type of leukemia that is rare for a child her age. The only known cure for her cancer is a stem cell transplant. Her doctors have searched the worldwide registry for a stem cell donor and have failed to find a match. But the search continues and your blood might contain the right type of blood stem cells that could help Amy or many others just like her who are also searching for a donor match. Amy is currently fighting the leukemia with a new form of chemotherapy. 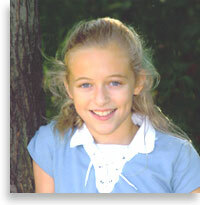 She volunteered to participate in a worldwide study for this drug because as she said, “it would help other kids”. You can help Amy and thousands of others who are searching every day, just like her, for their own donor matches. Click here to read how. Amy and her family have been actively involved with the Leukemia & Lymphoma Society in the Pittsburgh Area. Amy has been chosen as the Patient Hero for two of their programs: Kicks for Cancer and Team in Training. Please visit these Web sites to learn more.